Ever since I started using Windows 7/Windows 2008 R2 Operating System this problem is there. Uptime.exe utility crashes with error message “Calculates system uptime and availability has stopped working” when I use with “/S” option. The /S option of uptime.exe gives the historical information about computer startup and shutdown times. This information is very useful to understand how many times a computer rebooted. Since this built-in tool is not working, I explored the ways to get the last X reboots information from a PC using alternate methods. In early stages, I assumed this historical reboot information is stored in some WMI or file system so that I can easily query. After long wait, I came to know that it is actually based on event logs. All we need to do is parse event logs and get the historical startup and shutdown times of the computer. After knowing the source of information, my interest towards building my own solution to get the last X reboot times information has increased. I did it in powershell and used it whenever I needed. However, I felt having a powershell function may be easy way for folks like me who want to get their hand dirty with powershell. Other system administrators really won’t like it as they need to open powershell, look for command and type it there to get the required output. For various reasons, powershell console a slow staring application. Also it is difficult to remember the function name(or equivalent code) to get the reboots information. Given these reasons, I wanted to build a quick alternative, and that is when Uptime2.exe born. So I developed a C# console application which mimics the functionality of uptime.exe tool in windows and returns the output we need. “C# application? Hey Poweshell guy, what happened to you?” – Nothing really but somehow I liked the language and started exploring more. Still PS is my best choice for quick and dirty tasks. In fact PS made me my dive into c# very easy and quick. Keeping my happening aside let me talk more about the tool I developed. The uptime2.exe is a C# console application. It takes two parameters mainly, /Computername and /S. The ComputerName parameter is for querying the information from remote computer and “/S” option works the same way as in uptime.exe – i.e generates historical reboot information. When none of these parameters are specified, the tool just returns the uptime of local computer. I have too many plans for enhancing this tool. But don’t have enough time in hand at this moment. This is the best shape I can give my thoughts in 5 hours(yes, it took me that much). However, when I ever I find time, I will try to improve it to return more information like Timezone of remote computer(I think no tool does this right now), display last boot time, etc (if you think a feature is worth adding here, please mention in comments section). I briefly tested this tool in my lab and is giving the desired results. I took care of error handling to the possible extent I can. If you notice any errors, please report to me. You can download the tool from here (not available for download anymore) and use it for your requirements. It is FREE. I will share the code as well once my GIT repository is ready for usage. c:\>Uptime2.exe /s — gives the historical reboot information of local computer. c:\>Uptime.exe /computername:mypc1 /s — gives the historical reboot information of remote computer. Well, I felt I should add a disclaimer for this utility. Please test the tool in test environment before trying in production. I AM NO WAY RESPONSIBLE FOR ANY KIND OF DAMAGE MADE BY THIS TOOL. USE AT YOUR OWN RISK. Happy learning and let me know your feedback. Hello! I wanted to know if you had a chance to upload the code for uptime2.exe? Thanks! Very nice, but incomplete as there is no final overview with totals, etc. Finally I have debugged successfully the original MS uptime.exe, discovered where is the problem and fixed it! So if enyone wants that fixed version, feel free to PM me so I can mail it to you or publish it somewhere. Could you please send me your fixed version of MS’s uptime.exe to techgooroo@gmail.com. Would really appreciate your updated version to! Hope you still monitor this thread. Looking forward to hearing from you! Did you (or anyone else) ever get an answer from RaStr? Hi @ASB, @All, if you still see a need for having a uptime2.exe(which provides same output as uptime.exe), I can upload it to this post. But I would like to understand if you are still seeing this problem. I haven’t noticed it for long time on either windows 2008 or 2012. By using powershell, you are avoiding the need for using external executable. 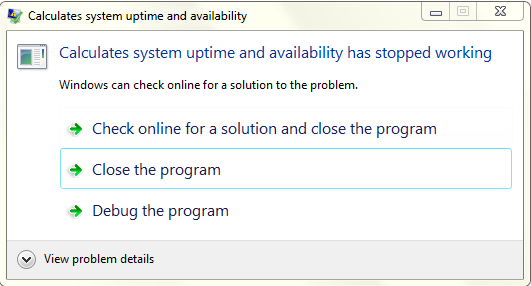 What folks are looking for in UPTIME.EXE is the /S and /P functionality, which this replacement tool does not have. I’d love to hear if anyone else here received the updated version, because I have not been able to reach RaStr directly. ASB, what does /p do? Now a days most of the tasks can be easily accomplished with PowerShell. I should be able to suggest a alternative using PowerShell if you share the requirement. An external executable is not necessarily a problem for many environments. Current OS: Windows 10 Pro Multiprocessor Free. This is the extended output that many were already used to. Could you please send me your fixed version of MS’s uptime.exe to xtech123@outlook.com. Hope you are still monitoring this thread. Could you send me the fixed Microsoft uptime.exe file? Since my E-Mail filters exe, is there a place I can download it? Have you tried to download it from http://techibee.com/wp-content/uploads/2012/08/Uptime2v1.1.zip ?? I would like to have a copy of your uptime2.exe. Thank a lot. Supper awesome to hear someone has a fix. You are a life saver. Please send me the fix you found. Greatly appreciate it. Can we have the same switches like uptime.exe (x86) for Windows 2008/Windows7? Thanks for the great tools. It will be good for me if you can enhance it to calculate the server uptime in certain period of time. I’m using uptime.exe to calculate monthly server uptime report and submit to management. Below are my batch command used previously. Just down loaded your uptime2 tool and attempted to run it on an XP sp3, with all current patches. Sitaram, this is a nice tool to have. Do you have plans to share the source code? uptime.exe normal yes, when used /s don´t have anything. If you can provide me the updated version of uptime.exe file, will be a great help. Thanks in advance for the same. Can you provide me the updated version of uptime.exe please ? System availability in %? This tool is to give uptime only. The availability is factory of many other things and this tool will not cover that. This tool does not work on remote computers. It persists on giving me info on the machine I run it on. /s command does not work at all on the uptime2.exe utility. Did anyone on this string ever receive a copy of the (apparently) fixed original version of uptime put out by microsoft or was that just someone claiming they had fixed it? Yes, please. I would also like to obtain the corrected version of the Microsoft utility, since it provides statistics that the alternatives don’t. Get more information about this item online. Thanks for reporting. We have removed this exe from downloads section. I have disabled the download because some people reported that their AV is not treating this application well. You can easily achieve this using PowerShell.